We have been waiting (somewhat patiently) for Hagerman Wildlife Refuge to reopen. They were hit pretty hard with the Lake Texoma flooding from a couple of months back. The amount of damage was still evident and the folks have been working hard to get things back to normal, but it is a long haul. We spent the afternoon there, whiling away the day with the company of many butterflies, waterfowl and other flying and crawling creatures. The butterfly garden was a real treat and we basked in the beauty that only He can put together, What fun. 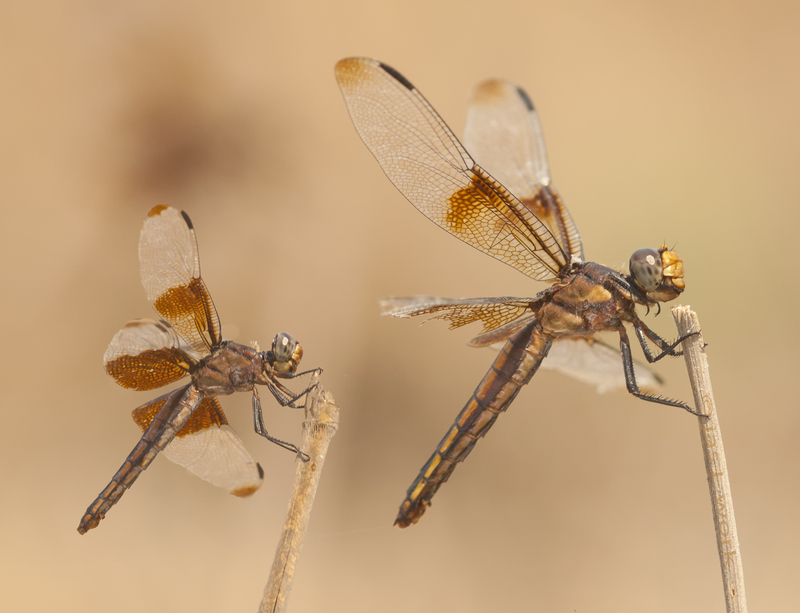 These two dragonflies were part of a gaggle of twenty or so all hanging on to the barest of little stalks. These two were taken from the same angle as I was on the ground and it was impossible to hold focus on the both of them. They were about a foot or so apart. So I made two separate photos with both in focus and then stacked them together in photoshop. What fun !